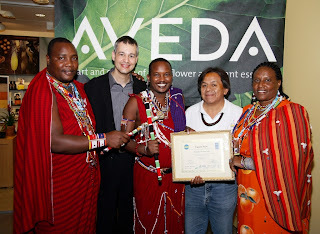 In keeping with Aveda’s commitment to environmentally and socially responsible business practices, the company is pioneering the way - on what is often overlooked or taken for granted – protecting the land rights and natural resources of the local indigenous peoples. This is termed - Indigenous Entrepreneurship. Indigenous representation at the UN event on May 23, ‘A Dialogue for the Future,’ included the environmental, economic and social interests of the Brazilian rainforest, the aboriginal peoples of Western Australia, family coffee growers in Mexico and the Maasai Shompole from Kenya. In Brazil, the Yawanawa tribe began efforts to protect 125,000 acres of rainforest land from loggers. In Australia, the aboriginal peoples have gained land rights and access to natural sandalwood resources enabling them to increase earnings seven-fold. While progress is being made, there are still diverse issues facing these indigenous entrepreneurs as they tackle opportunities and challenges partnering with corporations, donors, lending institutions and business development agencies. These include access to markets, funding, education, business acumen, political, legal and social issues. Doing good for community should be a key part of business purpose. Need for greater collaborative effort to help reduce poverty, eliminate infant mortality, have access to education, healthcare and food. Communities that bring people together will enable a healthier living environment and ultimately gain economic benefit. This is not, nor ever should be, a commodity-driven business and requires a selective strategy, supported by selective investment. Social disintegration doesn’t need big business approach and needs value-based partnerships. Time for business leaders to embrace their indigenous wisdom. There is a lot more work to be done ‘in the trenches’ conducting their business operations in a socially and environmentally conscious manner. And, as for those Maasai, allow me a childhood memory indulgence that is well deserving of a separate blog - to follow shortly.